Do you want to be alone on your tour?- This may seem like the obvious deciding factor but really think about it. When you imagine your Sunset Sail in St. Thomas, do you mind sharing the boat with a dozen other people or is it important to be alone with your significant other? Some tours you may prefer a group, while others you’d rather be alone with your family. Consider this with each excursion. Are you travelling with a large group?- If you brought family and friends along with you to St. Thomas, some excursions may “break-up” the group. For instance, you may have someone who would be reluctant to Kayak with or Snorkel alongside someone they don’t know. A private tour guarantees keeping your group together on an adventure without interference. Do you want to be on your own schedule? Some people thrive on structure while others prefer to go at their own pace. If you’re the latter, private St. Thomas tours would be suited to your taste as you can customize the stops and the length of time spent at each place even on a St. Thomas Boat Rental. Sightseeing Tours- St. Thomas is no stranger to breathtaking sights, and the island offers lookout points to capture the best we have to offer. A St. Thomas Private Sightseeing Tour guarantees a friendly driver who will provide local insight and smooth transitions as you experience St. Thomas and its many attractions on your excursion. An open-air Safari bus is your ride for the day, and since you’re on a private tour, no need to worry about crowds of people blocking that perfect shot. In addition to incredible views, your private tour includes historical sites, a bit of St. Thomas Shopping, and of course, a shot of rum. This St. Thomas sightseeing excursion can also be customized to include a St. Thomas Private Sightseeing and Beach Excursion or Private Sightseeing and Shopping Tour in St. Thomas to get the most out of your day. Beach Hopping- On your visit to St. Thomas, need to fight the crowds or cut your snorkelling short on a beach trip. A St. Thomas Beach Hopping Private Tour hits 3 of the top 5 beaches in St. Thomas, all in one excursion, and you select the stops. Choose between Magen’s Bay, Coki Point, Secret Harbor, Lindquist Beach, and Sapphire Beach based on your preferences for watersports and available facilities. Shopping- Don’t get caught in the hustle and bustle of the crowds or end up in a cheap souvenir tourist trap. Take a Private Shopping Tour in St. Thomas, and your friendly local guide will take you to the three premier shopping spots in St. Thomas where you can find a great local lunch spot on Main Street, a deal on high-end liquor in Havensight, and see some of the world’s largest yachts at The Shops at Yacht Haven Grande. Have a luxurious shopping experience with unrivaled views and deals on this St. Thomas private shopping excursion. Sailing- A St. Thomas Sail will lead to long-lasting memories, and sometimes it’s best to have those moments to yourself. A Private Half Day Sail with Sunset or a Private Full Day USVI Sail with Sunset is the perfect venue for a proposal or an intimate romantic occasion. A Private All-Inclusive Full Day Sail - U.S. Virgin Islands is a great excursion for a small family gathering, connecting with old friends, or even a bachelor/bachelorette group with snorkel stops and an open bar. Throw in some shore time on a Private Day Sail to Jost Van Dyke for any of these occasions or simply just to have a boat to yourself as you set sail for the BVI. Powerboating- If you’re looking to do some island hopping and want to set your own itinerary, a Private Charter Boat excursion is the fitting choice for your trip to St. Thomas. After setting out from St. Thomas, you select the destinations and snorkelling stops on this private tour, and with a valid passport, the customization options are virtually limitless as even the British Virgin Islands are at your disposal! Explore the Cave at Virgin Gorda or party all afternoon on the famous floating bar and restaurant, the Willie T. With room for up to 8 passengers on a 32ft Powerboat Charter or up to 12 passengers on a 35ft Powerboat Charter, these boat rentals are great for a family trip or luxurious day on the water with friends, or large parties can book a 44ft Power Catamaran for up to 32 passengers! Free your vacation stress with excursions that are crowd-free, restriction-free, and worry-free. Customize your St. Thomas sailing, boating charter, or island tour to meet the specific needs and expectations of your family with private excursions. 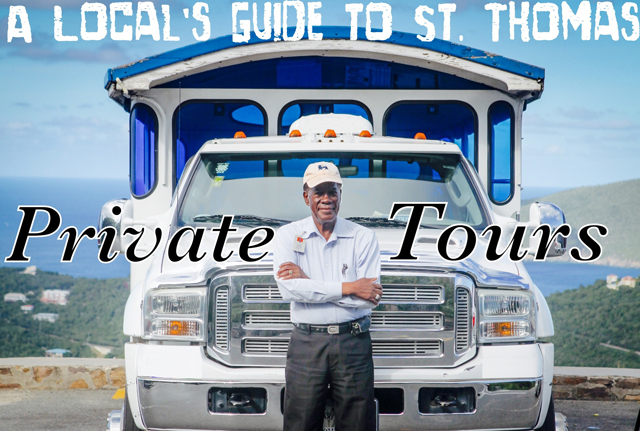 Be sure to check out our Private Tours page for the best private excursions on St. Thomas! If you have any questions about St. Thomas private tours or any inquiries about the islands, call or e-mail us for authentic local insight! A guide to private tour options for the top things to do on your visit to St. Thomas. Enjoy top St. Thomas activities & excursions on a private tour.